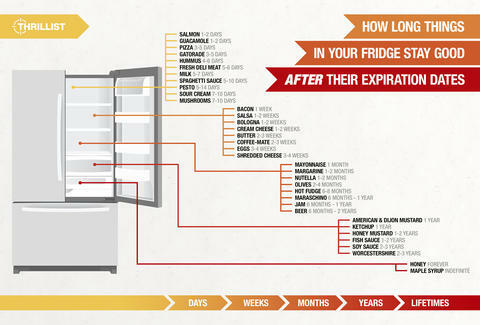 How Long Do Things in Your Fridge Stay Good AFTER Their Expiration Dates? You know that awful feeling you get when you throw away bacon, just because somebody named Oscar printed numbers on the package saying it was expired? No? You've never thrown away bacon, under any circumstances? Good man. You're hired. For something. But people who are less fantastic than you toss bacon -- and literally everything else in their fridge -- way too early. Eggs are good for an extra month. Honey mustard? You've got, like, two additional years. Don't believe the printed hype! Keep eating that fish sauce! Based on the tireless work of lead-bellied researchers at EatByDate.com, we compiled a handy infographic (see it all big and stuff right here!) 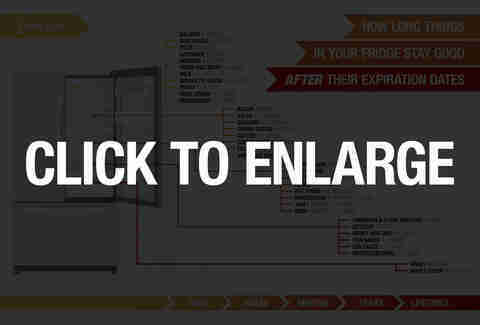 displaying just how long things like pizza, salsa, and even beer will last safely in your fridge after the printed date.